When a patient is faced with damaged or missing teeth, Smile Dental Group in Palmdale, CA will recommend dental implants to replace them. They are designed to replace the natural tooth root as well as the visible portion of the tooth, making it the complete solution for damaged or lost teeth. Teeth implants are the best option because they look and function just like your natural teeth. They can transform your smile and restore optimal oral health when your natural teeth are no longer functioning properly or are missing. 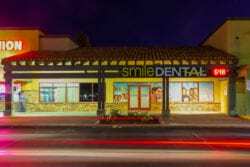 Our Palmdale and Lancaster dentist offices offer complete care for many types of dental implants. Whatever your situation is, we have the solution to fix it, even if you are missing all your teeth. With our advanced dental technology we are able to plan, place and restore many different types of implants. Dental implants are for people who are missing one tooth, missing several teeth or even all of their teeth. Patients must be in excellent overall health and have enough bone structure to support the implant. One of our expert dentists from our Palmdale and Lancaster dentist offices will perform a comprehensive exam to see you qualify for teeth implants. Improved oral health: There are many reasons why teeth implants are the best option for your oral health. When placing a dental bridge, your dentist will need to reduce the adjacent teeth, essentially damaging perfectly healthy teeth. An implant is also meant to replace the tooth root which will stimulate the jawbone and that will prevent bone loss. If you suffer from bone loss in jaw, your face will begin to appear sunken it and older. Improved self-esteem: Imagine being able to smile without missing teeth or without the fear of your restoration falling out. Dental implants give our patients their smile back, improving their appearance and restoring confidence. A beautiful smile can change a person for the better. No food restrictions: Removable dental restorations will keep you from eating a healthy diet because they are not durable enough to handle certain foods. Implants function just like your natural teeth therefor you can eat all your healthy, favorite foods. Better speech: Bridges and dentures have been known to slip around in your mouth from time to time. This can cause you to mumble or slur your words during conversations. Because implants fuse with your jawbone, they will hold your dental restoration is place without fear of it moving around or slipping. Permanent solution: The best part about a tooth implant is that it is a permanent solution because of how durable and stable it is. If properly cared for, it can last a lifetime. Other options for missing teeth, such as dentures, will eventually need replaced or repaired. That cost can add up over a lifetime. Convenient: Dental implants are the easiest and most convenient option for replacing missing teeth because they do not need to be removed and cared for. They also do not require any adhesive to keep them in place like dentures do. 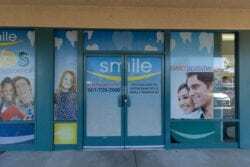 What to Consider When Choosing a Dental Implant DentistTop 10 Dental Care Tips For A Healthy SmileHow Can Dental Bonding Help Your Smile?